You are currently browsing the Suburban Homesteading – Frugal Living blog archives for September, 2012. The seasons are a changing, folks. I can feel it — in the morning air, crisp and cool; in the way the sun throws a golden cast over the farm when it sets in a sherbet colored southern sky, but mostly in the way I just want to hunker down and get ready for a long winter. A few years ago our days were full of a day job, school, sports, sheep and other farm chores. It was a busy time for us but I still wanted to put a heart-warming home-cooked meal on the table when we got home. It was the time of year when I’d reach for my slow cooker. A time when time itself was scarce, but a good meal wasn’t. All I needed was a stocked pantry, a little imagination and a plan. As we went about our busy day a batch of chili, stew, tagine or soup was simmering away, and when we walked through the door the whole house smelled of warm seasonings and fresh food. To bring slow cooker success into your busy life try these simple tips and in no time you’ll be setting a hearty meal on your table without standing in front of the stove for hours on end. 1. Be budget-friendly: Inexpensive cuts of meat, beans and grains bought in bulk let you use what you need or experiment with a variety of ingredients to find new favorites. 2. Layer: Foods at the bottom of the slow cooker cook faster. Place thicker, denser vegetables and large pieces of meat or those with bones on the bottom. 3. Fill level: A slow cooker should not be filled more than 2/3’s full to ensure food cooks evenly and the liquid doesn’t overflow (remember liquid doesn’t evaporate). 4. Go fat free: Trimming the fat will produce a more flavorful texture and reduce the amount of skimming after cooking. 5. Plan ahead: Keeping portioned containers of chopped vegetables and meats in the freeze are ready to toss in the slow cooker in the morning speeding up the preparation process. When you come home dinner is done! Pulled Pork. Low and slow is the name of the game, and the trick to cooking a pork shoulder into a flavorful sandwich topped with barbecue sauce and served with slaw. 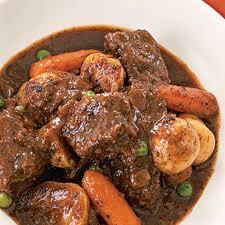 Beef Stew with Greens. Cook chunks of beef and root vegetables in the slow cooker, then stir in chopped kale or collard greens minutes before it’s ready to serve. Pot Roast. Trim chuck roast before slow cooking with parsnips, butternut squash, or potatoes and plenty of onions, carrots and garlic plus tomato paste for rich flavor sauce. Layer leeks, pork, apples and garlic in the bottom of a 5- to 6-quart slow cooker and sprinkle with salt and pepper. Pour in cider and vinegar. Cover and cook on low until pork is very tender, about 8 hours. Uncover cooker, stir in beans, and cook on high until heated through, about 30 minutes. Trim off and discard any large bits of fat from ribs. Sprinkle ribs with salt. Place in slow-cooker. In a small bowl, whisk together soy sauce, fruit spread, tomato paste, vinegar, ginger, garlic, five-spice powder and 2 tablespoons water. Pour mixture over ribs. Cover and cook on low until ribs are very tender, about 8 hours. Transfer ribs to a platter. Pour liquid in bottom of slow cooker into a glass measuring cup and let stand until fat rises to the top, about 2 to 3 minutes. Spoon off fat and pour liquid over ribs or use as a dipping sauce. Sprinkle with green onions and sesame seeds and serve. NOW – Ring the Dinner Bell and Come And Get It!! 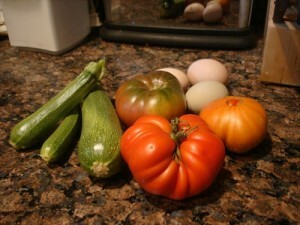 Heirloom tomatoes, zucchini and organic eggs all picked just as the sun rose. What a breakfast they will make. I know it’s long past the Labor Day weekend and I am woefully late in posting anything on the blog, but it’s been one of THOSE months and it has barely just begun. Between working on the greenhouse (a pleasurable labor to be sure), starting a new job and family issues my days have not been my own lately. But—this post isn’t about sleepless nights or long days. 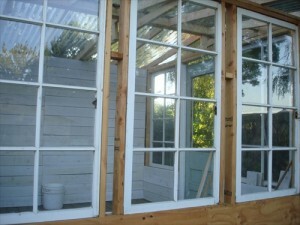 It’s about a greenhouse and the future of growing things and the self sufficiency it brings. Since Brianne left for college my sis and I, two single women farming in suburbia, have been trading weekend labors at each others house, and Labor Day Sunday was my day. We started early, trying to get as much done as we could before the heat and uncharacteristic humidity drove us inside. The roof of the greenhouse went up earlier in the week. A clear poly corrugated style with a ridge cap and an old copper rooster weathervane I’ve been hauling around for decades. I think all farm building should have a weathervane. We concentrated on finishing the plank siding inside and out, measuring and cutting and nailing the rough hewn whitewashed boards, moving around each wall like two dancers floating over a shiny polished floor. I am always in awe at how in sync sis and I are when we undertake one of these projects. It’s like we can read each others mind, handing off tools before they are asked for, fetching more wood before the last piece has been used, refilling water glasses without request. I guess when you live around someone, work with someone for as long as we have you get a 6th sense about each other and you instinctively know what comes next. The rhythm of the work was steady and somewhat mesmerizing because with no regard for the weather we worked straight through the day, not breaking for lunch and right into the evening. We finally stopped when the sun cast a long shadow over our work, making it hard to see in the dusk. There is some left to do, and of course stocking it with my garden supplies, tools, seeds and soil will be more fun than labor, but that is still a weekend away. We have a few trim pieces to put up and build the planting shelves, but for the most part the long awaited greenhouse is done. By the time our heat wave breaks I may be ready to start a few early spring flowers, a cool weather garden or some fall veggies. I might even try my hand at wintering over a few tomatoes; fresh tomatoes at Christmas sounds wonderful. Work is so much more fun when it is shared. September is here, folks! I can hardly believe it is just one month until my beloved October. The thought of it makes my heart swell. This long Labor Day weekend started early with a steel gray glimmer of morning and a breeze that glided over me, soft and cool; the first gentle kiss of autumn. It was still in the 50’s when I ventured outside in my sweatshirt and muck boots, watering and feeding chickens and rabbits. There are no leaves falling yet, but the world is changing, moving ever so slightly from one season to another. You can feel it in the sunrise. You can feel it in the change from our blistering August heat wave. You see it in the evening as the sun sets farther to the south and the rising moon throws a golden cast over the farm. We are picking tomatoes and zucchini almost daily, little shards of insurance for a small family. A pint-sized mason jar filled with fresh herbs sits on the windowsill sending a wave of fragrance through the house. My lone sunflower is beginning to bloom, tall and big and yellow; the last survivor from marauding birds and scavenging chickens, and a few apples hang on the tree growing fat and juice, until they are plucked off and put into a pie or cobbler or spice bread. Some of the older hens that were beyond being good layers and a rooster were taken to the feed store to be given away. I’ll hold on to the few good layers I have until spring then think about increasing the flock. Production is a big deal on our little farm and those who can’t pull their weight in stocking the kitchen don’t stay around to waste precious feed. Sounds harsh I know, but that’s the reality of farm life. Winter preps are still at the forefront of my mind. I feel an urgency about getting this farm settled for a long winter, maybe even more so than in past years. The agricultural meteorologist, the one all the farmers listen to for weather forecasts, is calling for an El Nino winter; and that can mean only one thing — RAIN — and lots of it. Making sure the farm is set to handle such storms drives my actions. The new batch of meat birds is slatted to arrive next week and now that the opossum family has been caught and relocated I am more excited than ever to get some meat in the freezer. I still have a few half chickens left. There are also packages of lamb, the ducks we raised in spring and containers of soup base and cooked down chicken carcasses that can be made into casseroles and potpies. The pantry is pretty well stocked with dry goods like beans, lentil, rice, barley and pasta; all the makings for a hearty and warm winter meal; and with Brianne off to college even the smallest amount of meat and veggies seem to go farther. Even with all this, I’ll make a stock up trip to fill in and take advantage of prices before we see increases caused by this summers’ drought. The greenhouse now has a roof, a barrier from the wind and rain. The plan is to finish the walls this weekend. With any luck the whole thing will be done in a week or so and I can begin planting root veggies and salad greens in the fall garden. Maybe I’ll even try a few potted veggies that can stay in the greenhouse over winter. 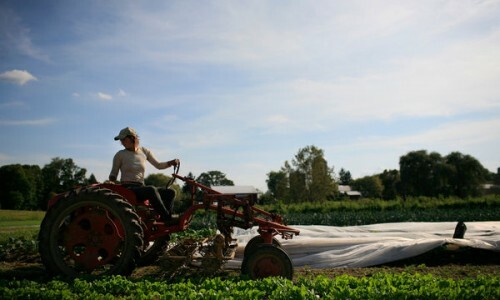 One of the nice things about living in an area where you can garden 365-days is that we do not have the pressure to “get seeds in the ground” like other areas of the country. I still have firewood to bring in and the house to switch over from summer to winter. My list is made and it’s thrilling to cross things off. By the time wood smoke circles the farm we’ll be ready, mark my words. This will be a warm and comfy farm house, glowing and smelling of winter. I am smiling, folks, for these are all small banks of insurance. Money may be nice, but it can’t beat a warm stew fresh from the farm. Now that’s simple wealth!